US (PA): "Better Christmas Cactus season compared to last year"
"A suitable Petunia for all places in the world"
The Christmas Cactus season at Van Hoekelen Greenhouses in Kline Township (PA) has come to an end, and Alexander van Hoekelen is pleased with this year's results. "Due to the combination of the upgrades we did, the quality of the crop, and the good US economy, this year was better compared to last year." 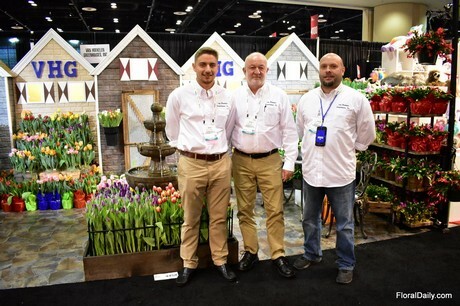 Alex van Hoekelen, Nick Sprengers and Larry Huft of Van Hoekelen Greenhouses at the PMA Fresh Summit in Orlando (FL), USA. During this time of the year, the Christmas Cactus is the biggest crop for Van Hoekelen Greenhouses. "About half of our 16 acre greenhouse is filled with this crop, and the remaining space with several other items, including poinsettias, ivy topiaries, frosty ferns and a small portion of potted and cut tulips." On 8 acres, they grow 4, 6, 8, and 10 inch in pot and 8 inch hanging plants. 4 inch takes up the most space and is, according to Alexander, probably the most popular size in the US. "They want this little one to put in the window or on their desk." Van Hoekelen Greenhouses supplies to supermarkets all over the US, and as the season is coming to an end, Alexander can state that it has been a better year compared to last year. "First of all, the quality of our crop was better and this was also noticed by the retailers; quickly after their first order, we received another. Secondly, we did some different programs and added some different items, some upgrades so to speak. Finally, the good US economy probably contributed as well. We see that consumers are buying a lot." Whereas Christmas Cactus is their main crop during this time of the year, their biggest crop throughout the year is the cut tulip and other bulb flowers. They are one of the largest cut tulip growers in the Northeastern part of the country, and when all Christmas Cacti have left the greenhouse, they will start getting into the bulb season again. This season runs from January until Mother's Day. However, Van Hoekelen started to grow a small portion of tulips in advance of the season. "On request of a customer, we started to grow potted and cut tulips a bit earlier, we started around half October with cut tulips. It was just a test to see if he could increase the sales of this product a bit earlier and so far, it is doing OK. Of course it is not as crazy as the normal tulip season." Van Hoekelen Greenhouses distributes many types of seasonal plants and flowers such as tulips, hyacinths, mums, poinsettias, cactus, etc. and has been in the business for about 30 years now. They have their roots in the Netherlands, and that is where it all started. Alexander's father, Cok van Hoekelen, has a lifelong work experience in the greenhouse field and began his career working with his father on a bulb farm in Holland and earning his degree in Horticulture. He relocated to the US in 1969 and brought his knowledge and experience to the country. To this day, they are working with Dutch methods, like growing their tulip in a soil and sand mix, and several times a year they visit the country to learn about the newest developments. 2019-04-23 "Protecting the most vulnerable plants is a necessity"